Who do you want to be today? What's in your mind when you start the day? What's your first thought? Do you go through the day keeping your eyes open? Seeing, looking and observing? Hearing listening and registering? What is the last thought in your mind when you end the day? Do you think that there is more to life and living? As we grow ad observe the life that happens around us, we come to realize that there are not too many absolute truths or absolute lies. Things are not black or white and that they are mostly gray. And perhaps we derive clarity depending on how dark or light the shade of gray is. But there might be times, if we listen, will reveal to us the truths we want to live by. And we being wired the way we are - which is usually, to follow the pack because it is the safest thing to do, wondering if our near and dear and even the not so dear would approve - decide to ignore these insights. And thus let the magic slip right between our fingers. After a point, like the wise say, these magical opportunities decide to find a better medium of expression, reveal themselves to those that will work on them and manifest them into reality. Someone once told me that ideas float around in clouds. And though several may see them, some might identify them, only one or two might actually have the guts to work on these ideas and bring them to the fore. Who is the first mover, is the million dollar question. How many times have we heard some people say, 'Yep, I had the very same idea"? During my mentorship program, I was mostly listening and observing. Every cell in me listened, observed and learned. Thank God for that opportunity. A lot of my talented co mentees in the program who came from Libya, Egypt and Palestine had to speak about the turbulence in their countries to most people, they were constantly asked questions because everyone was interested to know what a 'real' person said, to see how different it is from what the media was feeding them.I met truly inspirational people at various events like the WNBA Luncheon, or a Fortune Most Powerful Women gathering, or at the board room of American Express at the WFC, or the cabins of the various women who had given me time from their super hectic schedules to talk to me, understand who I was and how they could help me, Joan Amble and Denise Pickett, my mentors from AMEX and AMEX Open, I have come to know even better that opportunities present themselves to us each day. It truly and really depends only on us on how we want to make it work, if at all. Possibilities are endless. And this entire trip reinforced the belief what my mom inculcated in me, to be genuine, honest, no bull-crapping and to be closest to the truth as absolute as it seems to me. Even though the experiences and life in general might lead us to question and even decide against such a path, which is definitely difficult, but its all well worth it. Insofar as the life I have seen so far, I have had my own share of experiences, some of which I wish you the reader dont ever have to go through. Even more so for the ones that my mother had to face. Inspite of what everyone may or may not tell you, this life is yours. You can be all that you want to be. Everything you want to be. We are at most time, everything that others want us to be, isnt it? So its not really beyond us to not be all that we want to be. So there you go. Give your own personal definition to success. Or just dont define it at all. May it rise beyond definitions. Most of the time, my mother and I were advised a lot of things. The ones closest in my memory given to me - "Don't talk. Dont host a TV Show. Dont host a radio show. Thats too much talking for a singer. Dont blog. Dont tweet. Dont be accessible to people. Make yourself rare. Behave like a celebrity. Put up your price. Dont do dubbing. Concentrate only on music. Dont think about Blue Elephant and sell the company. Quit Business. Get off Facebook. Stop tweeting...." Tired? I usually hear stuff like this on a daily basis. Sometimes I do think that being simple and humble got me nowhere and it did lead to a lot of people taking undue advantages. I did my duty. But they didn't do theirs. Anyway, I cannot change from my core values. Mom had the wisdom and courage to decide against all of that. The question I hear the most " How do you manage your time.. you are doing soo much??!" Honestly the one answer I can give - my mom. She has, without spelling it out, let me be everything I wanted to be. And more. Her insights and her unshakeable guidance is why I am here today. And will be all that I want to be in the future as well. Everything which will be firmly rooted in the ethics and the truth I have grown up with. So... who do you want to be today? And how do you want to get there? Really you are managing your various Avtars very nicely. I read ur tweets and blogs regularly. Interesting thing is you also motivate your readers in a positive way. True, how most of us are ridden by others each and every other day! It is also true that we cannot let things happen on its own. The rest who take their life onto their hands, are the ones that are the happiest, not because they have succeeded in everything that they did, but because they are responsible for themselves! Great Article!! No other words strike me now to write here. 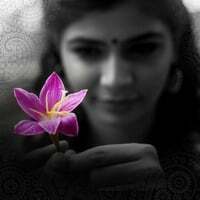 We want to b a huge fan of Chinmayi! Just follow her through this blog or twitter! he he he am I right! Nice post..!! i remember that,u had been featured in the Metro plus newspaper as "MISS MULTIMEDIA"..Keep achieving and may u alwayz b encircled with happiness...! Amazing Chinmayi - I take a bow to you and amma. "Everything which will be firmly rooted in the ethics and the truth I have grown up with." - True. Chinmayee - This post is too good. Awesome post chinmayi..A real eyopener to all those who let their lives controlled by others and keep cribbing about it..
Good Post; Like your attitude and respects to your Mom. You should follow other advice but keep blogging. By the way, I saw ur blog only now. Congrat! To say the truth, I have nothing to say after reading the comments which were already posted. All things are already said :) The post is really great. I have not seen any celebrity like you who dedicates their time space for public and expressing thoughts. This make us feel that u r near to heart. Please continue the same. And you have a unique style of expressing thought in words. U r gud writer too. I have never seen a celebrity spending there time space with public like you. Ur words has your thoughts and it has life in each letter.Its inspiring. You r unique. U r gud writer even along with ur voice. I wish, all success come to you. Very good writeup.Your level of maturity is well beyond your years and that explains your success.
" The question I hear the most " How do you manage your time.. you are doing soo much??!" Honestly the one answer I can give - my mom. She has, without spelling it out, let me be everything I wanted to be. " A superb article...the way you write almost similar to the one Harsha Bhogle writes.. anyway i admire you both..
Hi, I accidentally came across your blog and this post is very real and interesting. I think in India, success is defined [only] by money making potential - (exceptions apply ;-)). You earn a "crazy" prefix when you talk about an idea out of "Safe" zone.